During the early years of the twentieth century Paxman provided a number of experimental or teaching steam engines to educational and training institutions both in the UK and overseas. I think it highly probable these were supplied on very favourable terms with a keen eye to the potential commercial benefits. No doubt some individuals and organisations considering the purchase of a steam engine would seek advice and recommendations from senior members of staff at such institutions. Perhaps more importantly, many of the young men attending these institutions would, later in their careers, occupy senior engineering appointments and play major roles in deciding what steam engines should be purchased by their employers' organisations. It was much to Paxman's advantage that college staff, and young engineers under their tutelage, should become familiar with Paxman as a progressive and innovative builder of high quality engines. Another probable benefit was access to the results of experiments and studies carried out in these institutions under the direction of well-qualified academic staff; information which Paxman could feed back into the ongoing development of its engines. Rohan Lamb, curator of the stationary steam engine museum at the National Steam Centre, Melbourne, Australia, wrote to the Essex Record Office with a query in 2001. 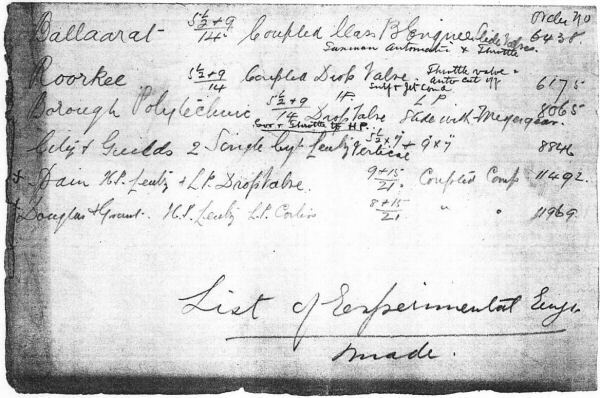 Whilst dealing with the query the archivist at the ERO stumbled across a piece of paper, tucked in the front of a book, which listed six experimental engines made by Paxman. An image of that handwritten note is shown below. The surviving copy order book entries for each of the engines listed on the note are shown below. To each entry has been added the relevant comment on the handwritten note, expanded (in italics) where appropriate for the sake of clarity. Other additional notes are also in italics. 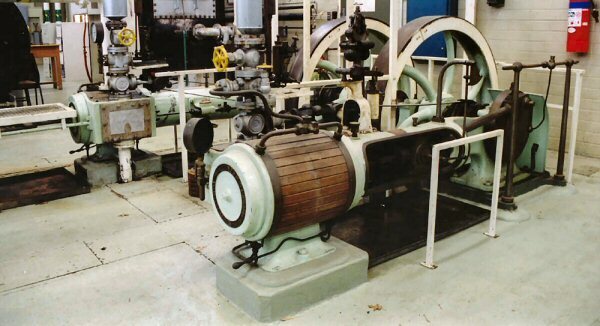 Handwritten Note: 5½" + 9" / 14" Coupled Drop Valve (Engine). Throttle valve (governor) & auto cut off. Surf(ace) & jet cond(enser). Description: 8 HP Coupled Compound Girder Engine 5½" + 9" x 14"
Handwritten Note: 5½" + 9" / 14" Coupled Class B Engine. Slide Valves. Paxman Automatic (expansion gear) + throttle (valve governor). The engine at the University of Ballarat before transfer to Sovereign Hill. Description: Coupled Compound Experimental (Engine) 5½" + 9" x 14"
Handwritten Note: 5½" + 9" / 14". HP (High Pressure cylinder) Drop Valve. LP (Low Pressure cylinder) Slide (Valve) with Meyer gear. Gov(ernor) & throttle (valve) to HP (High Pressure cylinder). Description: Two vertical Single Crank H S (i.e. High Speed) Engines 5½" x 7"
Handwritten Note: 2 Single Cyl Lentz vertical. 5½" x 7" & 9" x 7". 1. The order book description of the engines, as shown above, is basically correct except that the second engine was of 9" bore x 7" stroke as per the handwritten note. A surviving Paxman microfilm record of the order contains the following comments: "2 x vertical single crank double acting high speed open type … to be arranged so that they can be connected together by a coupling shaft when required to run as a compound engine." The HP cylinder to be 5½" x 7" and the LP to be 9" x 7", to run at 400rpm. Drawings to be approved by Prof Coker. Paxman also to supply 'test bars' 3" square by 6 foot long "for experiments in conductivity such as described in proceedings of Institute of Civil Engineers Vol 131 - 1891-8 on the law of condensation of steam, etc." The test bars were made of cylinder metal and also the liner metal. The instructions were that the cylinder material test bars were to be cast at the same time as the cylinders and covers. 2. By 1932 the engines were at University College, Gower Street, London. Handwritten Note: Spain. HP Lentz (valve gear) & LP Drop Valve. 9" & 15" / 21" Coupled Compound. Handwritten Note: HP Lentz, LP Corliss (valve gear). 8" + 15" / 21". Description: Special Experimental Compound Engine 5¾" + 9½" x 14"
Where Sent: Cooper's Hill (Egham, Surrey). Description: Experimental Coupled Compound Girder Engine 5½" + 9" x 14"
The engines listed above, with the varied types of valve gear employed, are clear evidence of Paxman's interest in innovation and experimentation in the early years of the 20th century. It is fair to conclude that the Company was keen not only to promote its engines to young engineers but also to encourage investigation into the performance of simple and compound engines and the respective merits of different types of valve gear such as slide valves with Meyer gear, drop valves, Lentz and Corliss valve gear. If anyone knows of any of the above engines having survived, other than the Ballarat engine, would they please contact me with details.